I’d like to cut their heads off with a sword but the blade isn’t long enough to reach all of them so it will have to be a gun. Master the rifle, master the scope. For anything sacred to remain, half must kill half. According to news sources, a cloning expert recently died. Not to worry, he’ll show up for work again on Monday. I meant to cover Season 8 before the episodes started up again in 2009, but failed. Three 2009 episodes premiered before I even knew S-ville was back on! Season 8 is much better than the dreadful Season 7. That’s all I’m gonna say about it for now. Guess which one they crucify? A mentally-unstable breeder who already had 6 kids (damn near in a row) now has EIGHT more at once with unholy science procedures. Having already suckered the state (bankrupt Commiefornia, now there’s a surprise) for nearly 200 grand in disability and wearing her poor parents to nervous breakdown, the breeder now “shops around” for a tv show/interview that will pay…. 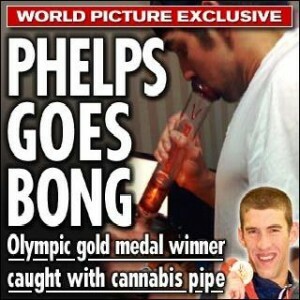 But Michael ‘Phish’ Phelps? All but crucified for a picture of him taking a hit off a bong. I’m no Phelps Phan but I like the guy, he’s made a lot of people happy, which is more than can be said for any 11 assholes anywhere in government. You can be a suspected murderer or breed children into a poverty-stricken environment with no father, but take a puff of God’s smoke and they want to kill you. Incidentally, a spokesjoint for NORML was on the local talk radio station this morning. He says about 35 out of 60 Congressfolks would vote to legalize marijuana tomorrow, which, of course, is not enough.